Wendy Snyder’s typical day this past summer might seem mundane at first glance. Work eight hours, split over two shifts. Sleep on a boat, in tight quarters, with two other workers. All with little time to text, tweet, or even phone home. 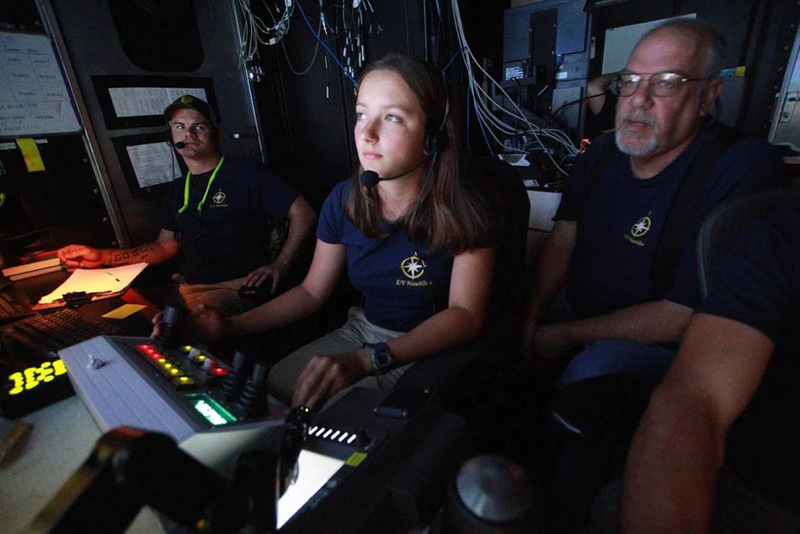 But the University of Rochester junior mechanical engineering major wouldn’t trade this experience for all the water in the Pacific Ocean – which is where she spent her summer internship. 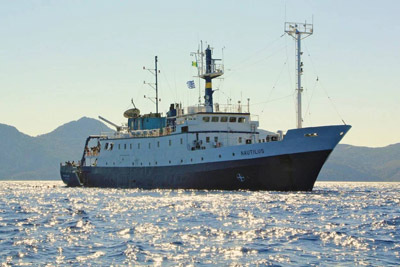 Snyder worked aboard the E/V Nautilus (shown at left), a vessel dedicated to the exploration of the ocean’s biology, geology and archaeology. The ship has been operated since 2008 by Dr. Robert Ballard, best known for the discoveries of the wrecks of the RMS Titanic in 1985, the battleship Bismarck in 1989 and John F. Kennedy’s PT-109 in 2002. The Nautilus is equipped with two unmanned Remotely Operated Vehicles (ROVs), and one of Snyder’s duties was piloting these ROVs. Snyder learned about the internship from older brother William, who recently earned his master’s degree in ocean engineering from the University of Rhode Island. William has worked on the Nautilus as a data engineer the past three summers. He was an ROV pilot for the first time this past summer, but his time with Wendy overlapped only one day. Wendy applied for her internship online, interviewed with a handful of supervisors on Google Hangout and learned in late March she would be boarding the ship this summer. She flew to San Diego and started her internship July 25. The Nautilus eventually moved north to Los Angeles, Monterey Bay Sanctuary and then San Francisco, with a few port stops along the way. The internship ended Aug. 20. The ROVs aboard the Nautilus are named Argus and Hercules. They are capable of diving up to 4,000 meters deep – much deeper than any scuba diver could – and can stay down indefinitely as power is provided via a cable connected to the ship. The vehicles are operated from a control van on deck, where pilots switch out in four-hour shifts. 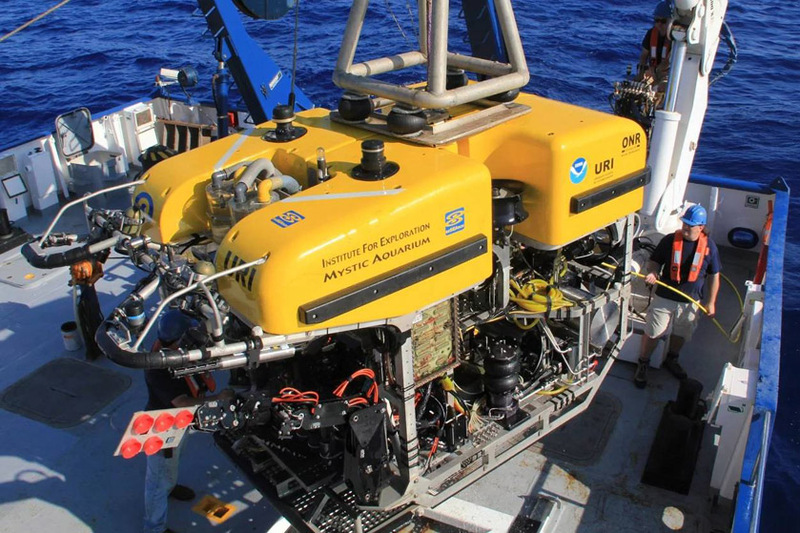 Snyder was part of a six-person ROV team, performing maintenance checks on both vehicles as well as piloting them. Her shifts were 8 a.m.-noon and 8 p.m.-midnight. During these times, she was either in the control van piloting an ROV (usually Argus) or working on the vehicles in the shop to prepare them for the next dive. As pilot, she had control of all the lights and cameras, as well as thrusters to turn the vehicle side to side and a control for the winch to adjust the depth of the vehicle. Snyder is one of four children to Willam Snyder, himself a mechanical engineer, and Diane Snyder, a preschool teacher. Brother William, 24, will start a full-time job later this fall with the Naval Sea Systems Command (NAVSEA) in Newport, Rhode Island. Sister Kimberly, 22, graduated from Cornell in May with a bachelor’s degree in environmental science. She lives in Ithaca and works part-time for the Cornell Lab of Ornithology. Brother Andrew, 18, is a freshman at Towson (Md.) University. Wendy’s interests extend beyond engineering. The music minor plays violin and viola and participates in the University’s Symphony Orchestra on violin. She’s also part of the University of Rochester’s Baja SAE team, which designs, builds and tests all-terrain vehicles. But Snyder is grateful for the chance to fulfill this internship. She says it introduced her to many opportunities in mechanical engineering and gave her a lot of connections. Jim Mandelaro is the University of Rochester’s Student Life Press Officer. The Hercules ROV is brought back aboard.